We have combined our very popular ARP Head Stud Kit with a pair of Head Gaskets from Victor Reinz. These MLS Style head gaskets include the Dowel pins to complete your installation at a Great Low Price! Victor Reinz Head Gaskets...Head gaskets for 6.0 Powerstroke are for applications to mid 2005 with 18mm dowel. After mid 2005, the dowel will be 20mm. It is always best to check the dowel size before ordering. Head Stud Kit ....Ford 6.0L power stroke diesel. ARP Cylinder Head Studs it is for good reason that virtually every top professional engine builder relies on ARP head studs for their all-out competition powerplants. Simply stated, there is not a better stud setup on the market today. For openers, ARP Head Stud Kits uses a premium grade 8740 alloy that is rated far superior to aircraft quality. Then, each stud is placed vertically in special racks and precisely heat-treated to 200,000 psi. This procedure ensures complete heat penetration and the results are far superior to those lesser quality studs from other manufacturers who just dump pieces in a basket and hope for the best. Need FICM's? We have them on hand..... Always! A combination of our very popular ARP Head Stud Kit with a pair of Head Gaskets from Victor Reinz. 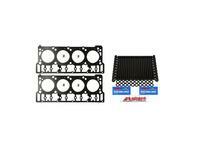 This kit includes the head gaskets wtih 18mm dowels for your 2003 to Mid 2005 Ford 6.0L Diesel. A combination of our very popular ARP Head Stud Kit with a pair of Head Gaskets from Victor Reinz. 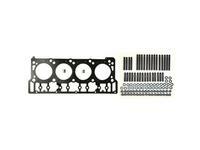 This kit includes the head gaskets with 20mm dowels for your Mid 2005 to 2007 Ford 6.0L Diesel.